The two carved stone statues, nine-foot tall, representing the classical goddesses “Minerva” and “Urania,” came to the National Building Arts Center with a fascinating provenance. Originally, the statues were two of 25 colossal sculptures that once embellished the roofline of the St. Louis Mutual Life Insurance Building at the northwest corner of Locust and Sixth Streets in downtown St. Louis. 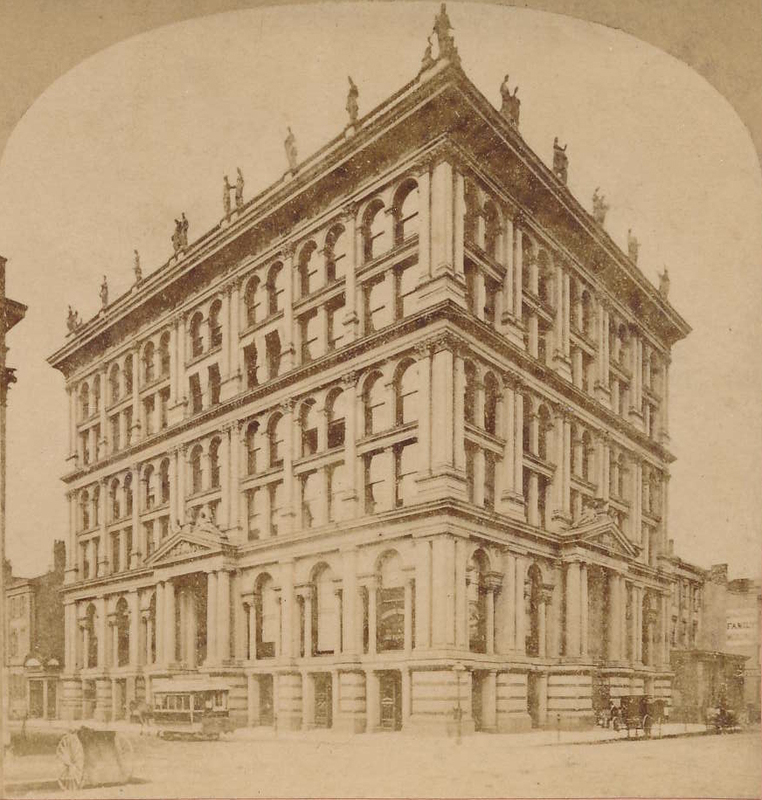 This lavish, six-story office building costing $700,000 was dubbed the ‘Palace of Insurance’ when it was completed in 1872 to designs of George I. Barnett. The building was demolished in 1956. 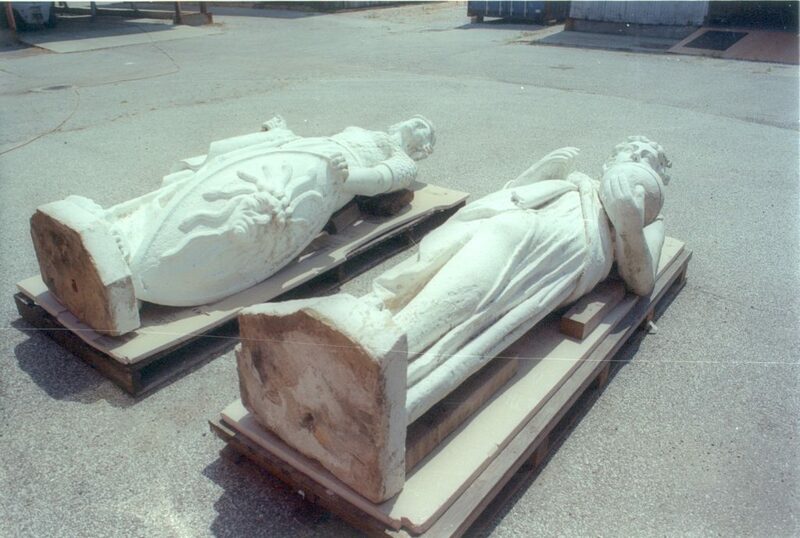 The statues, however, already had been removed from the roof seventy years earlier in 1884-86, when the building’s new owner, Equitable Life Insurance Co. (New York), took them down in order to increase the height of the building by five stories. At that time, it was reported Jay Gould, the famed railroad financier with offices in the building, recognized the artistic value of the sculpture. Gould sought to preserve the statues, but he was unable to find a St. Louis institution willing to accept them. Over the next 125 years, the whereabouts of the statues generally became forgotten and remained somewhat a mystery until three were identified in Ironton, Missouri, where, since the mid-1880s, they had graced the grounds of a 19th-century estate. The design of the entire group of statues had been commissioned to St. Louis artist Leon Pomarede (ca. 1807-1892), a native of France, and executed by a collaborative team of seven sculptors trained in Europe. The “Minerva” figure was carved by Henry Marquardt from Stuttgardt, Germany; the statue of “Urania” (representing ‘science’) was executed by William Ross of London, with finishing work by Serephin Cottin from Grenoble, France. For a time, after completion of the St. Louis Mutual Life Building, the three sculptors were associated in St. Louis under the title, Henry Marquardt & Co. The H. Marquardt Marble & Granite Co. continued into the early 20th century.